Buy Now for Only $29.95 USD! The PDF Reader can rotate a PDF doc when you are reading it, but cannot save the PDF. PDF Rotator can permanently rotate PDF files and save it. Some scanned PDF documents contain the thwartwise pages, and people cannot read these files. 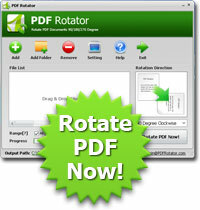 PDF Rotator can rotate those PDF pages properly. If you have PDF files upside down, you can use PDF Rotator to rotate 180 degrees. PDF Rotator can rotate PDF documents in batch mode, even if you have more than 1,000 PDF files. "A user friendly desktop app rotates the pages in your PDF documents."